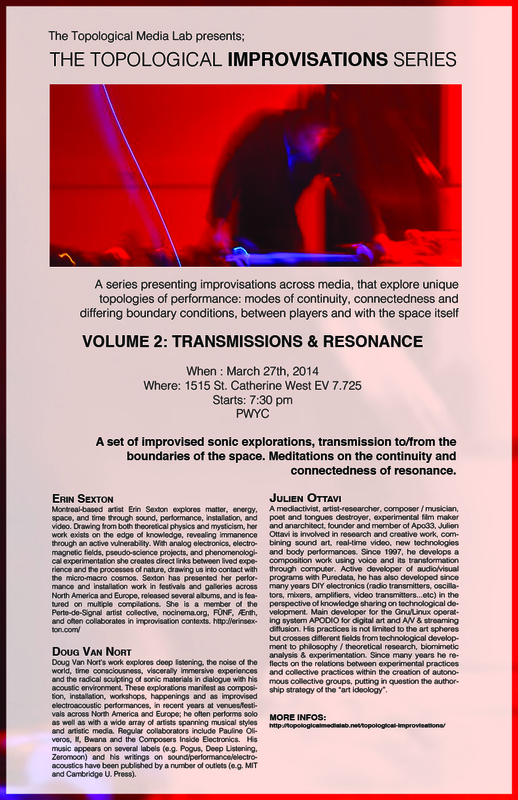 A set of improvised sonic explorations, transmission to/from the boundaries of the space. Meditations on the continuity and connectedness of resonance. Julien Ottavi is part of a generation of audio artists to emerge in the 90\`s that indicated some of the directions that music and soundart is taking. While at art school, he organized a series of concerts, bringing international artists from the experimental scene to Nantes, drawing touring musicians to movements happening outside of Paris. This became not just a destination but a nexus for collaborations. This resulted for example in the group Formanex to perform graphical scores of electro-acoustic music, and in Apo33, an artists collective to facilitate, nurture, and disseminate creative audio practice. In this way, Julien represents the energy and initiative of a present day artist – activist through practice, organizing as performance, publishing as networking, open source and open aesthetic. This fluidity of working across boundaries of style and role are seen in his music, physical with computer, performative and reflective. Montreal-based artist Erin Sexton explores matter, energy, space, and time through sound, performance, installation, and video. Playing between theoretical (meta)physics and experimental (al)chemistry, her raw post-minimalist approach embodies immanence through an active vulnerability. With analog electronics, crystal oscillations, electromagnetic fields, and electro-chemical improvisation she creates direct links between lived experience and the processes of nature, drawing us into contact with the micro-macro cosmos. Sexton has presented her performance and installation work in festivals and galleries across North America and Europe, released several albums, and is featured on multiple compilations. She is a member of the Perte-de-Signal artist collective, nocinema.org, FÜNF, Ænth, and often collaborates in improvisation contexts. Doug Van Nort’s work explores deep listening, the noise of the world, time consciousness, viscerally immersive experiences and the radical sculpting of sonic materials in dialogue with his acoustic environment. These explorations manifest as composition, installation, workshops, happenings and as improvised electroacoustic performances, in recent years at venues/festivals across North America and Europe; he often performs solo as well as with a wide array of artists spanning musical styles and artistic media. Regular collaborators include Pauline Oliveros, If, Bwana and the Composers Inside Electronics. His music appears on several labels (e.g. Pogus, Deep Listening, Zeromoon) and his writings on sound/performance/electroacoustics have been published by a number of outlets (e.g. MIT and Cambridge U. Press).